Posterior helical pits (PHEPs) are an uncommon trait that appear to follow an autosomal dominant mode of inheritance. 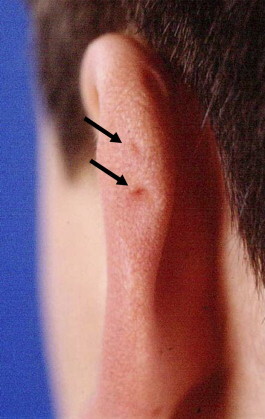 PHEPs were linked to different syndromes when they were first examined; three were directly associated with ear pits, BWS, SGBS and RTS. The syndromes where more frequent in families with this trait, however in many cases, no relationship between the two phenotypes was observed, suggesting that they are not directly linked. After those observations were made, many studies have been conducted to try to reveal the connection between PHEPs and the syndromes, but the results are unclear. A study focused on PHEPs and BWS demonstrated that PHEPs are inherited as an independent trait but there's still a type of linkage with BWS, possibly representing causal heterogeneity. Currently it is suspected that there might be an unknown site of mutation in the chromosome that causes the syndrome, and ear pits might be linked to that one instead, but that is yet to be probed. I find this fascinating because my family possesses PHEPs and as of now, no one has been born with any of the syndromes, but I wonder if it could happen in future generations? Also, the ear pits were passed to every family member, from my grandfather all the way to my youngest cousin, except for me, perhaps I'm adopted.